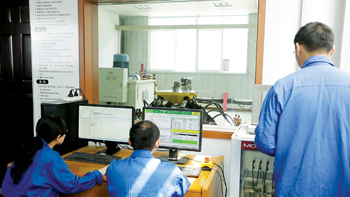 Wuxi XinDeBao, an OEM supplier of exhaust pipe sub-systems for major car brands, recently completed a successful flex coupling durability test programme with a new simulation table specifically designed by Moog to handle smaller payloads of up to 100 kg. 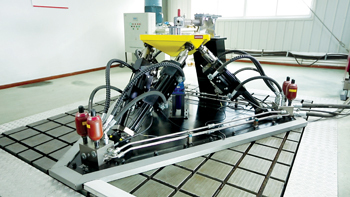 The Hydraulic Simulation Table 100 kg (H-ST-100), is a new addition to Moog Simulation Table solutions, designed to meet XinDeBao’s specifications for the testing of automobile exhaust pipes. It is also capable of performing durability evaluations of other small vehicle components. The Moog Simulation Table is available in electric or hydraulic versions depending on the performance required. With the Moog H-ST-100 test solution, XinDeBao can conduct flex coupling component durability tests to simulate the relevant movements of two boundaries (engine manifold end and exhaust pipe end) in 6 degrees of freedom (DOF) from a real-time time history domain. ‘Time history files’ are simulated through the Moog Test Controller and Replication and Runner application software, to accurately replicate any specific road conditions needed for the tests. The test system is very compact and provides excellent accessibility during testing. XinDeBao, which supplies to brands such as Volkswagen, GM, Ford JV, FAW and SAIC, received a request from Tenneco China to establish a local solution for durability and validation tests. A loyal and long-term Moog customer, Tenneco approached Moog to find a solution. Talks with XinDeBao and Tenneco quickly confirmed to the Moog Test Team in China that only a new version of the HST could accurately meet XinDeBao’s test requirements. Moog promptly completed the preliminary design and was selected as the system contractor to deploy the test solution. Moog delivered on schedule, and the test solution performed exceptionally well during the factory and customer site acceptance tests. “Successfully delivering the H-ST-100 to XinDeBao has established a solid reference for the auto market for this new solution,” said Will Opie, general manager of Moog’s global test business.